From mountain-top boulders in meadows shared with wild ponies to adventurous routes high on the sandstone walls of a 1,600-foot deep gorge, Southwest Virginia boasts enough rock and route diversity to attract climbers of all styles and abilities. Although the sandstone kingdoms in West Virginia and Kentucky tend to steal the thunder, they also attract big crowds. If you’re into solitude, adventure, and the opportunity for new route development, you’ll find it here in Southwest Virginia. Although you’ll find plenty of notable crags with a few days’ worth of concentrated climbing, we’ve rounded up beta for the region’s gems. Load up the van and find out for yourself why the crags of Southwest Virginia are worth a visit. Situated between Mount Rogers and Whitetop Mountain, Virginia’s two tallest peaks, Grayson Highlands offers alpine-style vistas of forested peaks and sweeping meadows at more than 5,000 feet of elevation. Pepper in the string of over 100 wild ponies, and you’ve got one of the most unique climbing settings east of the Mississippi. 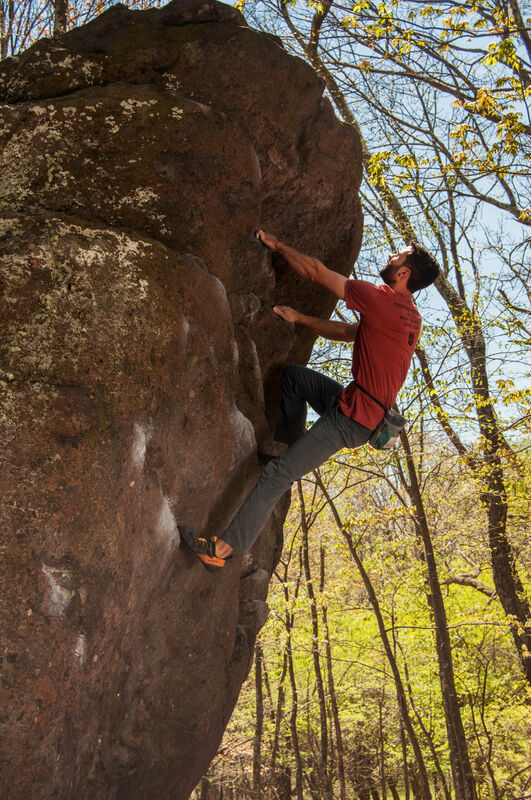 Grayson is widely considered the best bouldering site in Virginia and the best summer bouldering destination in the Southeast. With more than 1,000 problems covering several concentrated areas, there’s tons of rock—according to first ascentionist and guidebook author Aaron Parlier, the initial boulder field before the park entrance alone has nearly 20 problems ranging from V0 to V6, with many more routes waiting to be cleaned and sent. Geology conspired to make Grayson great, and climbers will enjoy the variety of crimpy rails and fingery flakes on the steep, angular rhyolite and quartzitic faces. Several boulder fields are situated at more than 4,900 feet elevation, and highs in the 70s with cool mountain breezes make summer a spectacular time to escape the soul-sucking heat and humidity of lower elevation destinations. The ponies were introduced in 1974 to prevent reforestation of the highland balds. Because these are wild animals, visitors should not approach, feed, or pet the ponies. They bite and kick when threatened, and a pony kick to the gut will certainly ruin your climbing trip. Because the highlands is a highly sensitive ecosystem, climbers are asked to keep group numbers low and follow Leave No Trace outdoor ethics to reduce ecological impacts. With bullet-hard sandstone similar to that of the well-trodden crags at West Virginia’s New River Gorge and Tennessee’s Obed River, the towering cliffs carved by the Russell Fork frame The Breaks, also known as "The Grand Canyon of the South." Recently opened to rock climbing and route development in May 2016, more than 70 documented sport and traditional routes from 5.7 to 5.12d—some up to 125 feet tall—will have you exploring the verticality of the deepest gorge east of the Mississippi River. With sun-bathed crags in the winter, shaded routes in the summer, and the vivid color explosion of the Appalachian autumn, The Breaks offers year-round climbing. Secluded camping and rest-day activities of deep-water soloing, whitewater rafting, and mountain biking may make you consider an extended stay. Before gearing up for your onsight of Put Your Hand Meat In It (5.9), make sure to swing by the Visitor’s Center and fill out a climbing waiver. Beyond the massive size of the gorge and the blank sandstone canvases awaiting visionary ascentionists, one thing that makes The Breaks so unique is its designation as an interstate park managed by a compact between Kentucky and Virginia. If you’re into route development, drop your current plans and head to The Breaks while the gettin’s good. Many areas, including Pinnacle Rock, Stateline Overlook, the Notches, the Pavilion, and Grey Wall are open to new route development. Route developers should check with park officials for updates and follow the current protocol of listing new routes on Mountain Project with protection information and a suggested grade. Given the sheer amount of exposed rock, expect the number of established routes to increase exponentially in coming years. While overshadowed by the amount of concentrated routes and magical settings of Grayson Highlands and The Breaks, stellar boulder problems and a worthy amount of roped routes await climbers along the scenic banks and plentiful rock of the Guest River. Located just outside Coeburn in the George Washington & Jefferson National Forest, Guest is bit further west than The Breaks and is a great alternative for multidisciplinary climbers carrying ropes and pads. Guest is broken up into 6 areas designated by order of the mile marker signposts as you walk the approach trail from the parking lot. With hundreds of established routes ranging from 5.6 to 5.13 and V0 to V10, Guest is a worthy stop on any road trip. Mile Two currently has the highest concentration of routes, including around 50 roped routes and more than 100 boulder problems. Look for the red tractor before the Mile Two signpost for the approach trail. The public access lot off of Route 72 just past the Flatwoods Group Picnic Area south of Coeburn is currently the only legal parking lot for Guest River Gorge access. According to the Access Fund, climbing access is currently allowed but tenuous. Respect all private property, rules, and regulations, and help keep it that way. Current land management is welcoming to climbers enjoying established routes and is upholding an active ban on bolting and new route development. The Breaks, Grayson Highlands, and the Guest River Gorge boast enough quality climbing and breathtaking scenery to satisfy any climber, but plenty of additional crags offer established and new route potential. A little bit of research will produce plenty of beta for other areas including bouldering at McAfee, Atkins, Bluefield Boulders, High Knob, and even the cycling paradise of the Virginia Creeper Trail. If you’re an Appalachian resident who frequents the bigger regional destinations or a road tripper passing through, don’t pass up the lesser known but just as outstanding climbing awaiting in the stunning mountains and verdant valleys of Southwest Virginia.